Price isn't the only thing when it come to getting your Apex products, experienced customer service is priceless! If you are looking to start a quality exercise regiment with just one complete workout machine, consider Apex. 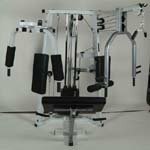 The multipurpose Apex Workout Machine offers a complete and total workout from a premier equipment team. Perhaps the most impressive aspect of the Apex Challenge Circuit 7000 Workout Machine is that it is designed specially for wheelchair users, but the sports equipment technology can also be used by able bodied people. Get your Para and Quad Apex Workout Machine from Sportaid now and save 22% today!